When it comes to pain, Never-Give-Up could be Tiger Woods’ middle name. Here’s snapshot of Woods’ injuries from December 2002 through March 2017. Read the whole article for the full details of Tiger’s injuries. December 2002: Woods has surgery to remove fluid from around the anterior cruciate ligament (ACL) of his left knee. April 2008: Woods has arthroscopic surgery to repair cartilage damage to his left knee. June 2008: Woods has reconstructive surgery on the ACL in his left knee. During the surgery, further cartilage damage is repaired, and Woods does not return to action for nearly nine months. May 2010: Woods withdraws during the final round of The Players Championship, citing what he believes to be a potential bulging disk. The injury was later diagnosed as an inflamed facet joint in his neck. April 2011: Woods announces that he will withdraw from the upcoming Wells Fargo Championship due to a ‘minor’ injury to his left knee and Achilles’ tendon. May 2011: Woods abruptly withdraws from the Players Championship after nine holes, exiting early from TPC Sawgrass for the second consecutive year. The injury is later diagnosed as both a sprain of the MCL ligament in his left knee and a strain to the left Achilles’ tendon, and Woods ultimately misses three months of action, including both the U.S. Open and British Open. March 2012: Woods withdraws with seven holes left in his final round at the WGC-Cadillac Championship, citing an injury to his left Achilles’ tendon. June 2013: After a T-32 finish at the U.S. Open, Woods announces he will miss the upcoming AT&T National due to a left elbow strain. March 2014: Woods withdraws on the 13th green in the final round of the Honda Classic, citing lower back spasms. August 2014: Woods withdraws on the ninth hole of the final round of the WGC-Bridgestone Invitational, citing lower back pain. 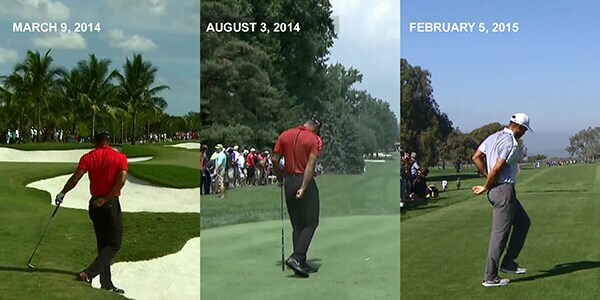 February 2015: In his second start of the year, Woods walks off after completing 11 holes of his opening round at the Farmers Insurance Open, citing a back injury. September 2015: After showing signs of improvement in his final start of the season at the Wyndham Championship, Woods on Sept. 18 announces that he has undergone a second microdisectomy surgery two days prior to remove a disc fragment that was pinching his nerve. April 2016: Woods, who hasn’t played competitively since Fall 2015 surgeries, announces that he will miss the Masters for the second time in three years. “After assessing the present condition of my back, and consulting with my medical team, I’ve decided it’s prudent to miss this year’s Masters,” he said in a statement on his website. September 2016: Woods announces in a statement that he “hopes” to return to competition at the Safeway Open, Oct. 13-16, the 2016-17 PGA Tour season-opener. October 2016: After committing to the Safeway Open three days prior, Tiger Woods officially withdraws on Oct. 10. He says in a statement, “My health is good, and I feel strong, but my game is vulnerable and not where it needs to be.” He also said he will not compete in November’s Turkish Airlines Open, but hopes to return at the Hero World Challenge in December. February 2017: Woods withdraws from the Omega Dubai Desert Classic before the start of his second round. Woods’ agent, Mark Steinberg, cites back spasms as the reason. Woods said he was feeling no pain following his first-round 77. March 2017: Woods says he is not “tournament ready” and misses the Masters for the third time in four years. May Tiger Never-Give-Up Woods find the combination of treatments that will put him back in the full swing of golfing. Strength, power, flexibility, balance, core stability, body awareness, even endurance… they’re all physical traits that every consistent golfer (even the fair-weather players) must possess. And the benefits of golf fitness training are not reserved for the young. Golfers aged 55-75 have also benefited from strength and flexibility training – both in terms of general health parameters and their performance on the course. If you are given a chance to be a role model, I think you should always take it because you can influence a person s life in a positive light, and that s what I want to do. That s what it s all about.